Every year a lot of bicycles just go missing in Scandinavia. Somehow they end up somewhere, supposedly most of them in countries further east. 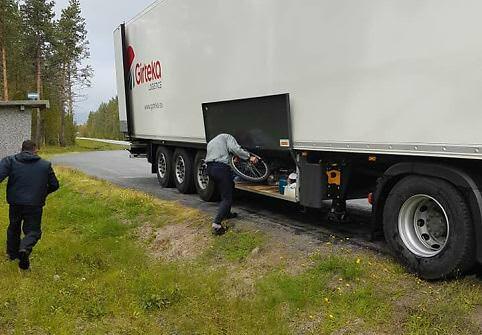 Stolen bikes are not prioritized by authorities here, so some public outrage is surely justified when Girteka drivers are caught red handed stealing children's bikes in Norway. For non-europeans: Girteka is one of the major logistics companies in Europe. Famous in Norway for slick, worn tires, also on icy roads - consequently creating occasional moments of pure terror as well as more frequent road blocks for the rest of us, and now also stealing bikes and transporting stolen bikes. I find that I can't respond to this without getting all antsy about wider issues to do with the media and exploitation but, aside from all that, the mind boggles at the sort of schemes some people come up with to rip off everyone else. The logistics business is probably almost as ripe for exploitation as the financial markets and you don't even need to wear a tie to get involved.